When a daughter is born, her mother has a thousand hopes and dreams for her, especially that they will be best friends one day. Unfortunately, even the best of intentions can go awry. There are so many challenges on the journey to adult friendship that the reality is fraught with friction and frustration. But a harmonious relationship is possible. Award-winning author Cheri Fuller and her daughter, Ali Plum, have been there and have discovered the keys to a healthy relationship. In Mother-Daughter Duet they share their story—each from her own perspective—in which they have experienced distance and tension, growth and challenge, and, ultimately, acceptance and harmony. 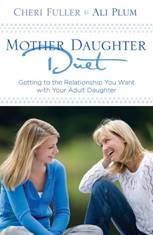 Filled with personal anecdotes and based on several basic principles (letting go; listening; respect; setting boundaries; and more), Mother-Daughter Duet helps moms repair the breach so that daughters want to draw close. The mother-daughter dynamic is intense, personal, complex, and unique. But mothers and daughters can achieve mutual respect and learn to celebrate their differences when they learn the two-part harmony of the mother-daughter duet. I've been very lucky growing up with the mom that I did. She understands me like nobody else. I would say out of a 10 star relationship ours is probably a 9. I mean nobody's perfect, right? :) But I know that there are so many women out there that don't have that close relationship with their mamas. I can't help but feel so sad for them. I can't imagine not having that closeness. Reading this book, I got to read from a mother and daughter's perspective. It shows you how such little things can be taken the wrong way and if not resolved it can blow into something bigger. I know I want to have an awesome relationship with Gracie as she gets older. I want her to be able to be herself and always know that I love her no matter what. So this helped me to see the things I might need to change. This is definitely going to be a book that I keep around.